OctPoWriMo 2018: It's Monday Morning - How About Scribing an Art Inspired Poem... or not? started talking about Keats and his “Ode to a Grecian Urn.” I enjoyed it, but as Morgan said in her OctPoWriMo blog post yesterday, sometimes I got stuck in the molasses feel of the 19th Century phrasing and language. Somehow the images Tess uses as prompts speak to me with a directness I wasn’t “hearing” via language. I read about ekphrastic poetry (poetry inspired by art) at the website poets.org and it said, "Modern ekphrastic poems have generally shrugged off antiquity's obsession with elaborate description, and instead have tried to interpret, inhabit, confront, and speak to their subjects. “ Yes! That’s what I do, that’s what I experience. I have facilitated writing sessions at Art Shows and the writers always create new insights from choosing a work of art and “becoming intimate” with it, which is how I think of getting to know a work of art by spending time with it, really observing it closely with an open heart. Today, it happened for me again at The Mag. The image was from Norman Rockwell, much more illustration oriented than I am used to writing from but something in the image yanked at my heart and after reading Tess’ response my fingers simply had to leap in as well. This link will show you what Tess wrote, complete with theimage. This link will show you what I wrote, complete with theimage. Other poet and prose writers’ words may be read at the Magpie Tales mainprompt website. You may even choose to join the poetic voices there – or not. Waking up to the possibilities of subjects within works of art today reminded me when the muse leaves the building there are places outside the building I can explore and see what there is to see, to feel, to smell, to touch and to be touched, smelled, felt and seen by. Curious about other modern ekphrastic poets? 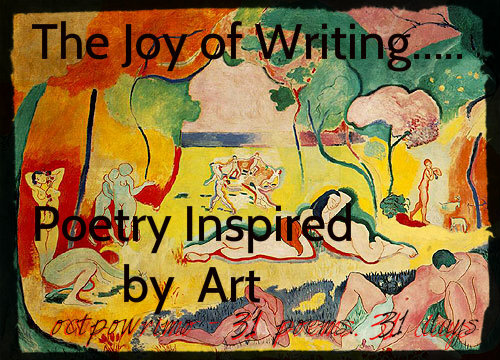 Here are several places to read ekphrastic poetry as well as learn more and be inspired. Sometimes when I work on images for my blog, I search for art that is not subject to copyright, usually older images. I have found many that beg to be written and re-experienced and re-imagined via my pen. The image I used today is Matisse - The Joy of Life. I have used it when I teach a writing session for students in a college Art Appreciation class. They are very inspired by this image - as am I. Perhaps there are images waiting out there for you as well both in OctPoWriMo and beyond. I always enjoy ekphrastic poetry. More the people use a common image or art source , it is amusing to see where each one lands ..
Ekphrastic poetry fascinates me. I tend to write first and look for an image to go with the poem later. This is perhaps the time to take a different direction and choose the image first. On a side note, I wrote a poem for NaPoWriMo last year (2012) that was composed entirely of titles of artwork found on art.com. You poets are incredible. I know I've learned so much from approaching poetry differently than I might have in the past. Something is clicking for me, I've written FOUR poems today! Funny - I was taking photos simultaneously so its as if the photos and the moment itself were the art.... yup. More Ekphrastic poetry!